XSEDE Capabilities and Resource Integration (XCRI) staff assisted in building a new high performance computing (HPC) cluster at Doane University in Crete, Nebraska. Adam Erck, the new Director of the Center for Computing in the Liberal Arts (CCLA) at Doane, asked the team to help implement the university’s first HPC resource after discovering XCRI at Supercomputing 2017. The new system, Onyx, is a 33-node system with 142 processors and was donated by the Holland Computing Center. In October of 2018, XCRI Engineer Eric Coulter and observer Rick McMullen from Texas A&M University traveled to Doane to help with the system build and provide HPC administrative training. In addition to helping build the cluster, the XCRI team worked with administrators to impart a full sense of the value that Onyx will bring, and held a user training session after the implementation was complete to familiarize users with the system. 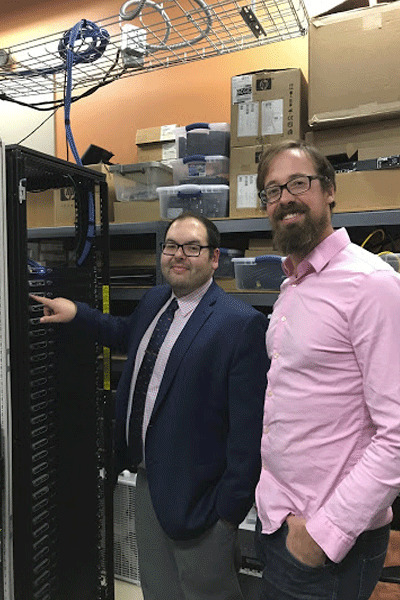 Adam Erck (left), director of the CCLA at Doane University, and Eric Coulter, XCRI engineer, pause for a pic in the process of powering up compute nodes on Onyx. The Doane CCLA offers a collaborative learning environment in which students and researchers can explore how computing can help them achieve their research goals across multiple disciplines. The system will be immediately useful to Doane faculty such as Dr. Mark Meysenburg, Dr. Tessa Durham Brooks, and Dr. Erin Doyle, who head the NSF-funded Digital Imaging and Vision Applications in Science (DIVAS) project. Dr. Meysenburg also chairs Doane’s Computer Science department and has started to incorporate Onyx into the curriculum. Researchers and students can use the cluster for small-scale computations and refine their codes before moving to larger XSEDE systems, or the nearby Holland Computing Center. Onyx also provides valuable experience to students in the basics of HPC administration through the CCLA Peer Consultant program. The XCRI team will continue working with Erck to ensure Onyx’s success, and to support Doane’s growing research program. As part of its Capabilities and Resource Integration effort, the Extreme Science and Engineering Discovery Environment (XSEDE) distributes an Ansible-based toolkit to minimize the complexity of building XSEDE-compatible Linux clusters for use by the US open science community. The XSEDE Compatible Basic Cluster (XCBC) toolkit provides a set of scripts that allows users to build a local HPC system quickly and easily with a similar user environment to larger XSEDE systems, based on the OpenHPC project. For more information on the XCBC, see https://portal.xsede.org/knowledge-base/-/kb/document/bfum.